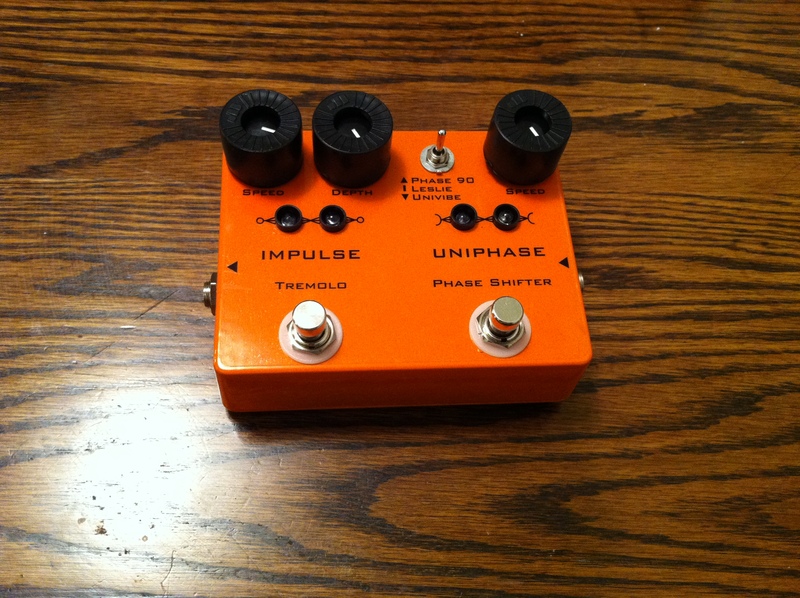 Uniphase Phaser / Impulse Tremolo guitar effects pedal. The internals of my Uniphase Phaser / Impulse Tremolo guitar effects pedal. This pedal is a combination of two different guitar effects pedals. The first is a heavily modified mid 90s MXR Phase 90. I’ve converted the circuit over to the orignal script logo 70’s model schematic, added a flashing led to indicate the oscillator speed, and also added a switch for different phasing textures. The switch has 3 positions, “Phase 90” (stock phase sound), “Leslie” (more of a rotating speaker sound), and “Univibe” (approximation of the classic Univibe pedal sound). The switch toggles 4 different capacitors between 3 different values each. The stock caps are all .05uF, and the switch toggles in more staggered values similar to the values in the Univibe circuit. In the center “Leslie” position the caps are put in series. 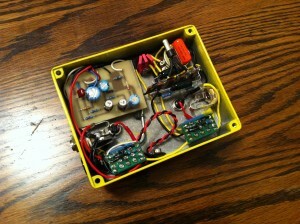 The second pedal is based on a classic tremolo circuit published in Electronics Australia magazine back in the late 60s. 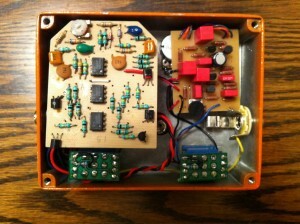 I purchased the circuit board for this effect from guitarpcb.com, and sourced the components separately (mostly from Mouser). This effect also has a flashing led. The effect has a classic Fender Blackface style tremolo sound but uses transistors instead of an opto-coupler to generate the effect. 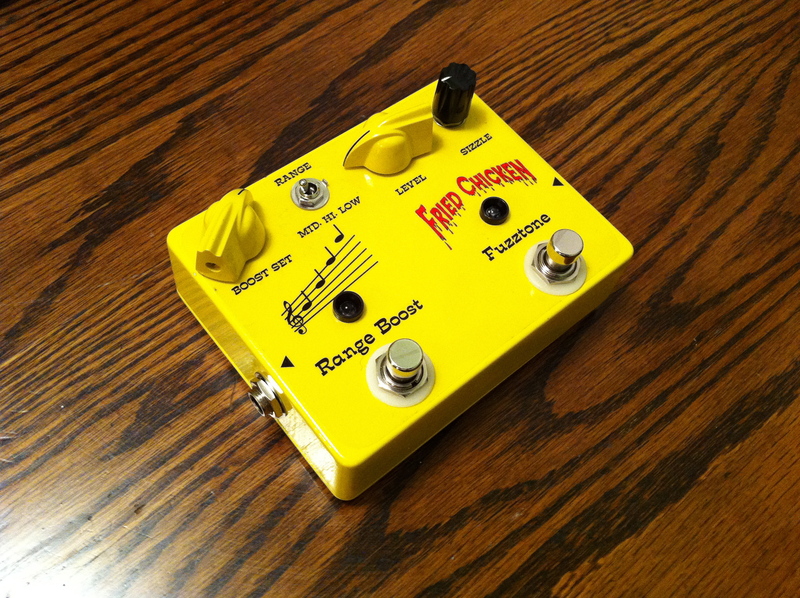 Fried Chicken / Rangemaster guitar effects pedal. 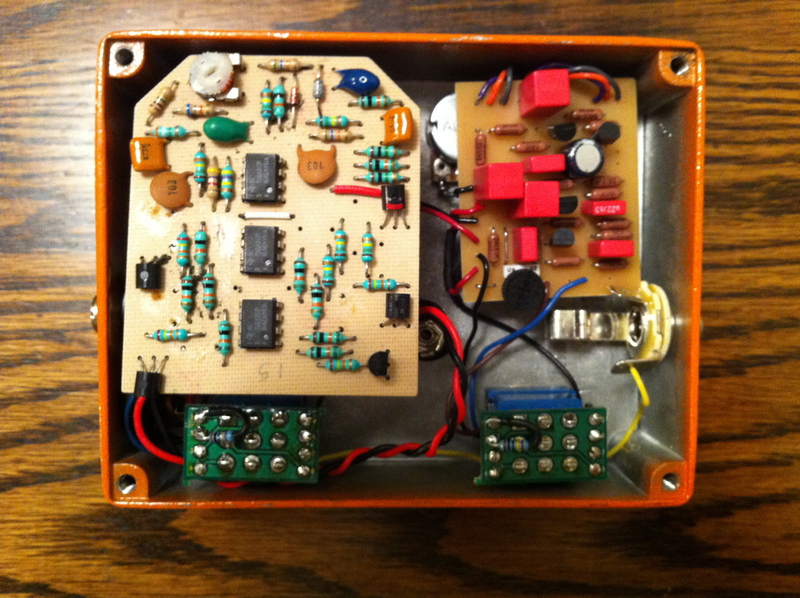 The internals of my Fried Chicken / Rangemaster guitar effects pedal. 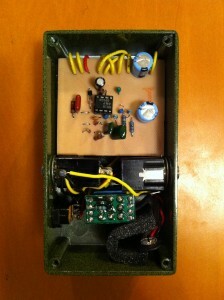 This is a combination of two pedals that I constructed in the past. The first, the “Fried Chicken” is a variation of the original Dallas Arbiter Fuzz Face pedal. I’ve done away with the fuzz control since I always just left it all the way up and used the guitar volume all the time anyway. I’ve also added a “sizzle” control which adjusts the bias of the transistors to compensate for the temperature variation issues they have. 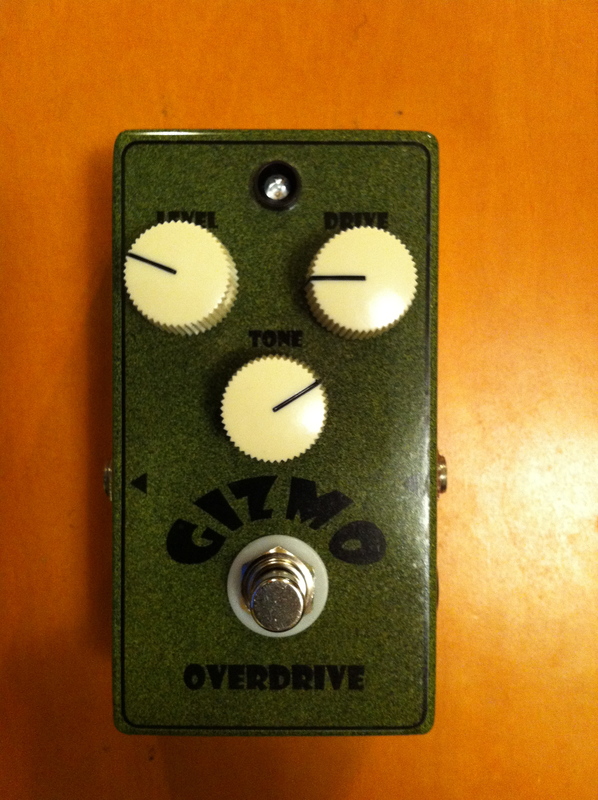 The second pedal is an enhanced copy of the Dallas Rangemaster Treble Booster. I’ve added a 3 way selectable “range” control which adjusts the lower frequency of the boost effect between high (stock), midrange, and low end. The internals of my Gizmo guitar effects pedal. This pedal is my take on the Ibanez Tube Screamer. It’s a simplified circuit without input or output buffers and tweaked part values. My Cyborg Rat guitar effects pedal. 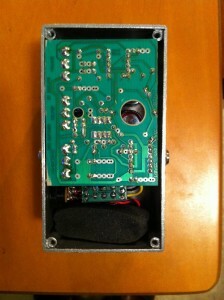 The internals of my Cyborg Rat guitar effects pedal. 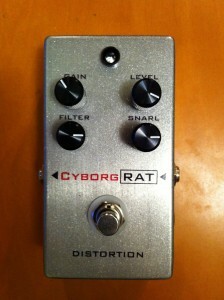 This is basically a hacked up mid 90s Pro Co Rat II pedal with an added “snarl” knob. This entry was posted in Posts on Saturday November 20, 2010 by aaron.